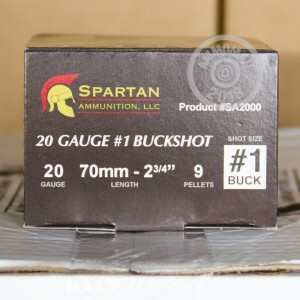 This versatile 20 gauge shotshell load from Italian brand Spartan will work well for hunting, self defense, and target shooting alike. Each 2-3/4" shell in this box of 25 fires 9 pellets of #1 buck. Though about .03 inches smaller in diameter than 00 buckshot, #1 buck is a highly effective shot size capable of bringing down both deer and human assailants. 20 gauge shotguns are the most popular in the US after the 12 gauge. They are known for their excellent handling characteristics, low recoil with the proper loads, and effectiveness for both hunting and self-defense. 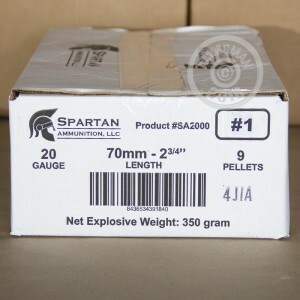 Buy up as much ammo as you need at AmmoMan.com--all orders over $99 come with free shipping!